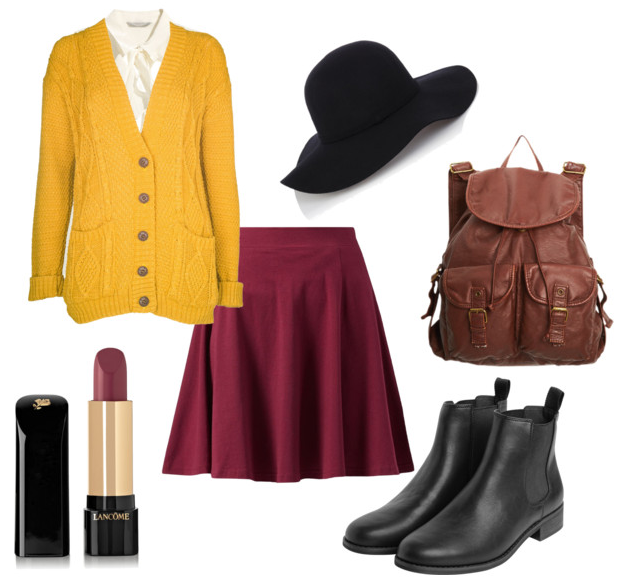 Quite a basic look for today, but perfect for this time of year! I’ve never been a fan of yellow but this year i’ve been eyeing up a large number of mustard yellow clothing pieces, including this beautiful large knit cardigan. It’s from Desire Clothing and it’s currently only £12, bargain. I love chunky cardi’s/jumpers, they just make me feel extra cosy! I decided i’d team this cardigan up with a burgundy shade as I think they just work beautifully together, don’t you? I’ve sort of built up an army of skater skirts and dresses now, they’re just so flattering. This one in particular is from H’n’M and it’s only £9.99. Pop some sheer black tights on underneath to keep your legs warm! Chelsea boots are a staple every year and this year, just about everywhere is selling them! I actually bought some that look exactly the same as these Monki ones but they only cost £15. These Monki ones are probably better quality, £40, but they look exactly the same, promise! Boots in general go with every outfit so they’re certainly a must have. Backpack’s do wonders for my back! I always seem to have so many things to carry around with me, i’m sure not all of them are 100% necessary but anyway, one shoulder bags really hurt my back. Backpacks even out the weight across my back and make it so much more comfortable. Plus, they look adorable! I think even a black backpack would have gone really well with this look, but I went for brown anyway because hey ho, why not? Y’all know about my love/hate relationships with hats. I always throw them in style boards but then when it comes to ordering/buying one I always chicken out! I don’t know, I just don’t think they suit me but they look rockin’ on everyone else! Sigh. This one is from Warehouse and it’s available for £25. Make up wise, I think a natural look with a nice autumnal lip shade would work great with this. This lip stick is from Lancome and it’s in the shade Berry Noir. It’s a deep shade but leaning more towards the pinky side of the spectrum so it’s not too daring. All of the shades from Lancome’s L’Absolu Rouge range are beautiful, deffo worth a look! So what do you think of this look? Would you rock it? Let me know! Love those boots, such lovely picks!